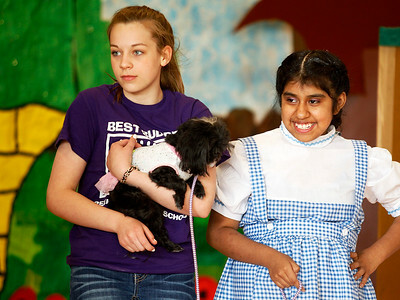 Matthew Apgar - mapgar@shawmedia.com Best Buddies Helper Delaney Peterson carries Chanel, a dog portraying Toto, for Nancy Amacende, portraying Dorothy, during a presentation of The Wizard of Oz put on by the Life Skills and Target Programs with help from Best Buddies Helpers on Thursday, May 14, 2015 at Creekside Middle School in Woodstock. 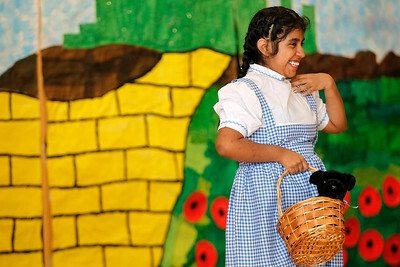 Matthew Apgar - mapgar@shawmedia.com Nancy Amacende acts out her role as Dorothy during a presentation of The Wizard of Oz put on by the Life Skills and Target Programs with help from Best Buddies Helpers on Thursday, May 14, 2015 at Creekside Middle School in Woodstock. 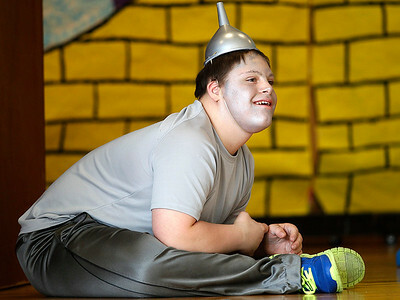 Matthew Apgar - mapgar@shawmedia.com Aaron Jacob portrays the Tin Man during a presentation of The Wizard of Oz put on by the Life Skills and Target Programs with help from Best Buddies Helpers on Thursday, May 14, 2015 at Creekside Middle School in Woodstock. 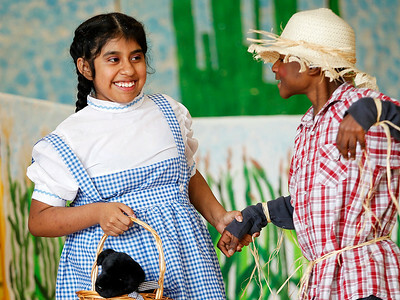 Matthew Apgar - mapgar@shawmedia.com Nancy Amacende, portraying Dorothy, holds the hand of Devontae Jones, portraying the role of Scarecrow, during a presentation of The Wizard of Oz put on by the Life Skills and Target Programs with help from Best Buddies Helpers on Thursday, May 14, 2015 at Creekside Middle School in Woodstock. 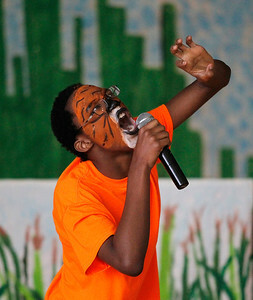 Matthew Apgar - mapgar@shawmedia.com James Farmer, dressed for his role as Tiger, replacing the typical character of Cowardly Lion, sings to the Katy Perry song "Roar" during a presentation of The Wizard of Oz put on by the Life Skills and Target Programs with help from Best Buddies Helpers on Thursday, May 14, 2015 at Creekside Middle School in Woodstock. 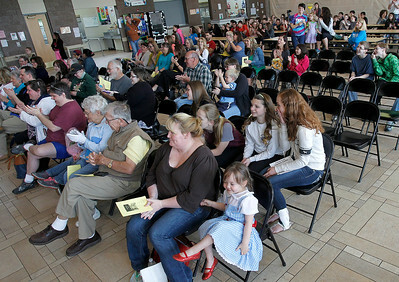 Matthew Apgar - mapgar@shawmedia.com The crowd watches during a presentation of The Wizard of Oz put on by the Life Skills and Target Programs with help from Best Buddies Helpers on Thursday, May 14, 2015 at Creekside Middle School in Woodstock. 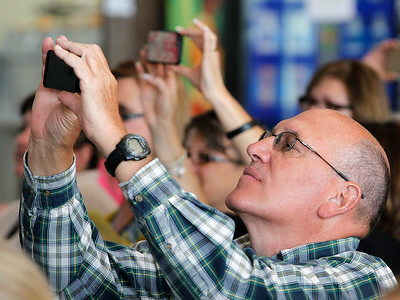 Matthew Apgar - mapgar@shawmedia.com Mike Kniola of Woodstock raises his camera phone into the air to record a presentation of The Wizard of Oz put on by the Life Skills and Target Programs with help from Best Buddies Helpers on Thursday, May 14, 2015 at Creekside Middle School in Woodstock. 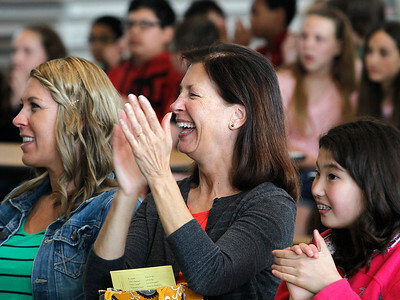 Matthew Apgar - mapgar@shawmedia.com Sarah Kozlowski, left, Denise Donahue, center, andKeanna Pederson applaud at the end of the presentation of The Wizard of Oz put on by the Life Skills and Target Programs with help from Best Buddies Helpers on Thursday, May 14, 2015 at Creekside Middle School in Woodstock.